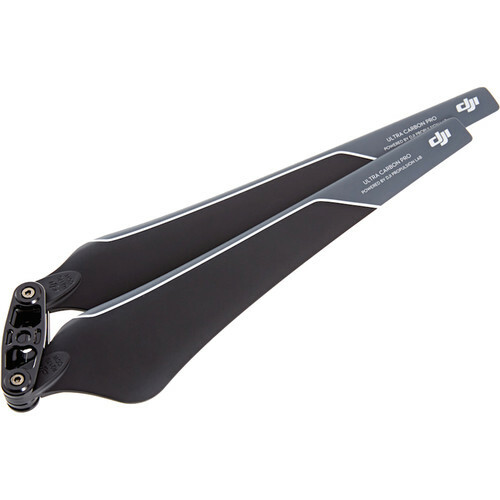 This bundle from DJI combines the CCW version of the 2170 Carbon Fiber Folding Propeller with the adapter kit required to bind the two blades together. The propeller is compatible with motors for the E2000 Tuned Propulsion System. The 21" 2170 Carbon Fiber Reinforced Folding Propeller – CCW version – uses Ultra Carbon Pro construction for lower rotational inertia in combination with high strength and stiffness. It is compatible with DJI's E2000 Tuned Propulsion system. The propeller's aerodynamic profile combined with the optimized electro-magnetic design of motor make the E2000 extremely energy efficient. Note: Requires E2000 / 2170 Folding Propeller Adapter, available separately. The Folding Propeller Adapter is used to bind together the two blades of the 2170 Folding Propeller for the E2000 Tuned Propulsion System by DJI. The adapter works with either a CW or CCW propeller. Once installed, no disassembly is required to fold up the propeller for transportation. Note: One adapter can be paired with a single propeller (two blades). Box Dimensions (LxWxH) 10.2 x 7.1 x 2.2"